La Reina is a small islet that lies just off the coast of Isla Cerralvo roughly 90 minutes boat ride from the centre of La Paz. The scenery along the way of the Baja peninsula and islas Espiritu Santo and Cerralvo is spectacular. The striking contrast between the colours of the desert and the sea are simply stunning and there’s a chance we will meet several marine animals during the ride to La Reina. This rocky islet is home to a small population of mostly mature male California sea lions. Females can also be encountered here, often swimming in close proximity to swimmers and divers due to their inquisitive nature. 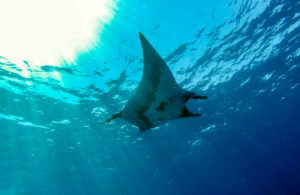 La Reina was historically a place where seasonal aggregations of giant mantas, and other manta species, was predictable. However, for 15 years, these gentle giants all but disappeared. Now since June 2018, at least 15 individual giant mantas have been identified and several of them have been tagged with satellite trackers and acoustic tags to tell us more about their behaviour and migratory pathways. 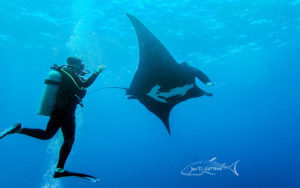 Join us on a responsible trip to snorkel or scuba dive with with amazing creatures. We use the opportunity of each visit to La Reina to contribute to research by capturing suitable photographs that can be used to identify individuals. This helps answer questions about population dynamics, seasonal abundance and other useful information. Included: Snorkeling equipment, tanks and weights for diving, National Park bracelet, ceviche lunch and refreshments, licensed boat with certified captain, certified marine biologist guide. Not included: Wetsuit rental (for winter months – $10 usd per person), scuba equipment rental – $35 usd for full gear, gratuities, land transportation. Trip highlights: Snorkeling, diving, giant mantas, swim with sea lions, coral reefs, reef fish, beaches, rock formations, sea birds. Season: Typically mid-June to mid-November.